When I was given the opportunity to try these gluten-free PREMIER PROTEIN bars through my association with FitFluential I eagerly jumped at the chance. 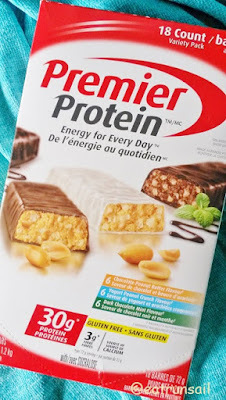 I have been a longtime fan of PREMIER PROTEIN and whenever they begin marketing a new product in Canada I am on board. These new high protein bars are now available at Costco stores throughout the country. I was really excited when I got my hands on this box last week. When I opened the box I was happily surprised to find good sized, hefty bars inside. They weigh about 72g (2-1/2 ounces) each, and at 280 - 290 calories, they are definitely not a snack bar! These PREMIER PROTEIN bars are meant to be eaten when you have missed a meal, or want a great high-protein refuel after a workout, or need something substantial to tide you over till your next meal. Each bar contains 30g of healthy protein and 3 g of fibre and they are also a pretty good source of calcium. And I must repeat... they are gluten-free. They are also relatively low in fat and carbs. I am all about the protein these days and I know many of you are as well. My biggest dilemma was which one to try first... just look at these terrific flavors! Eventually I chose the Dark Mint Chocolate to try first... and I shared it with The Captain after a recent morning run. We came in and stretched, then drank some water and we both felt like we needed a little something to eat, so I unwrapped a bar and split it in half and we shared it. I loved this bar! It is a nice, dark chocolate with a light mint flavor. Not too sweet. And I really like the crunch. Made me feel like I was eating something substantial... and even with sharing it I was still getting in 15g of protein. The next bar I tasted was the Yogurt Peanut Crunch. The Captain and I hit a local mall to do some shopping late one morning so I tossed a bar into my purse before we left home as I know The Captain's penchant for mall Chinese food at lunchtime... me not so much. The Yogurt Peanut Crunch bar made a good filling lunch for me, and I thoroughly enjoyed nibbling it, along with a cup of steaming hot chai tea. I had something slightly sweet and crunchy to enjoy and was not the least tempted by any of the mall fast food outlets. The Yogurt Peanut Cruch bar has a white yogurty coating and a very light peanut flavor. Nice. And it kept me satisfied for several hours, too. That is important. So, that left the Chocolate Peanut Butter bar... did I leave the best for last? Mmmm. Yup, I think so! We like to walk to the beach, and from our place, we can go three different directions and be on a lovely beach in about 20 minutes so it is one of our favorite activities on a nice day. 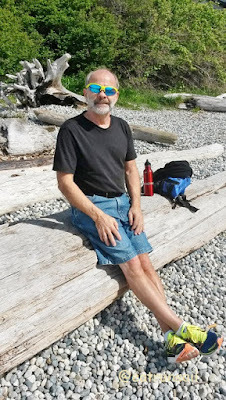 I tucked a bar into my pocket before we left on our walk... it made a lovely snack to share as we sat on a log and relaxed in the sunshine while soaking up the fresh salt air. Mmmm. Definitely a good combination of chocolate and peanut butter - if that is your jam, then THIS is your bar! 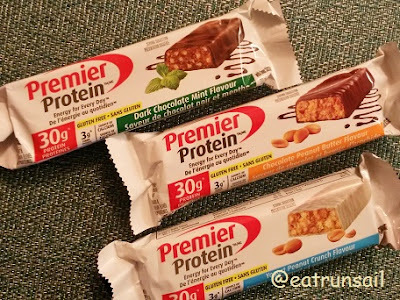 I have since discovered that these PREMIER PROTEIN bars also work for me very nicely when I want a little taste of something sweet... I just cut a bar into 4 pieces and nibble on one of them, putting the rest away for another time. I get to enjoy a crunchy and delicious treat, knowing that I am giving myself something that is not packed full of fat or sugar, and has lots of protein to keep me satisfied... no sugar rush and ensuing crash! 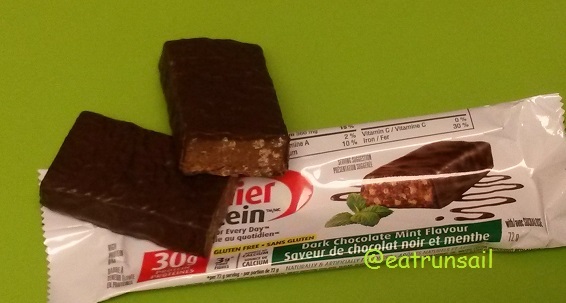 So, whether having a bar as a meal replacement, or an after-workout refuelling snack, or even as a bit of sweet-tasting treat, these PREMIER PROTEIN bars do fit into my lifestyle very easily. Remember, if you are in Canada, you can now purchase these PREMIER PROTEIN bars at Costco locations across the country. Which of the three flavors sounds the yummiest to you? They all sound really good. Ironically, the yogurt peanut crunch reminds me of a snack sold in shops here in Hong Kong. I have no idea what it really is, but the two look and sound very similar. I am all about the yogurt and I do love me some peanuts :-) I had gotten out of the habit of including bars in my… Food plan? It's not a diet :-) but lately my life has grown much more hectic and I'd love to have something I could throw in my backpack! The yogurt peanut crunch bar sounds super yummy! LOVED this bar, huh?! Welllllll maybe my husband will too!! I've seen these all over the internet--I haven't seen them in the stores. Glad to hear you liked them. Can't remember the last time I had a protein bar. The whey aftertaste never sits right on my taste buds (the same with protein powders). If I did have to choose a flavor, I'd go with dark chocolate mint! Chocolate and peanut butter is a great, classic combination that is always great to go to. Yum! These look really yummy. Not gonna lie, kinda made my mouth water a bit! Those are some big bars! I think the mint chocolate sounds the best, too! Not in Canada, so I don't know that we have these here, but I'm glad you're enjoying! That yogurt one sounds perfect with chai tea! All of the flavors sound super good! I need to look for these. The dark chocolate mint ones sound delicious! I'll have to check them out!